Robotics and computers are merging, there is no doubt about it, but questions remain- Why is it taking so long? Where do the standards belong? What tools are in the marketplace which assist integration? What are the necessary steps to take? One thing is clear, we need a roadmap to help guide us through this winding road of merging worlds. Join us as we dig deep into this discussion of integrating modern computers into our robotics platforms. We have uploaded the whole talk to youtube for those that couldn’t make it to the event. The talk is broken up into 10 parts so people can jump to the sections they most care about or watch the whole thing. 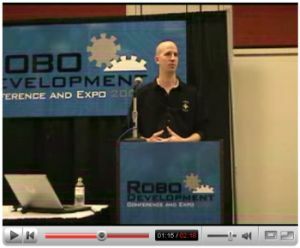 You can find the speech here on the Trossen Robotics System homepage. The TRS is an industry proposal for a standard Robotics Object Model which will solve many of the issues plaguing the industry today.